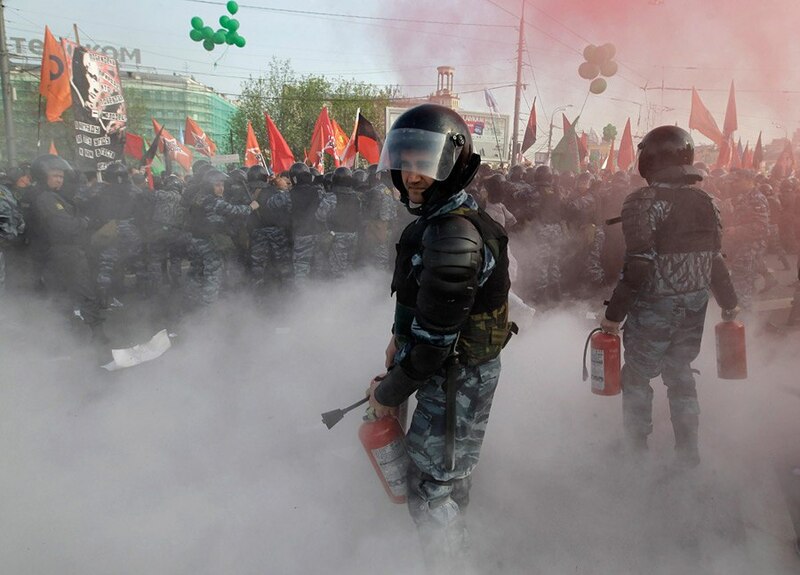 On the 6th of May, a lot of anarchists took part in almost all events which occured in Moscow. There was a peaceful march from Kaluzhskаja to Bolotnaja square, after that it became clear that the entrance was forbidden for people, protesting against the inauguration of Putin. The anarchists were in the front line, took an active part in fights with police, throwing at them bottles, umbrellas, sticks, asphalt pieces, smoke bombs and Molotov cocktails. Following that, anarchists tented and didn’t let displace them from the square. To build the barricades the anarchists used metal cordons and even biotoilets. The most active protesters were arrested, however, some of them managed to rescue from the policemen. The both sides had the wounded, a part of whom were hospitalized. Despite the fact that the police were able to divide 100,000 of protesters into small groups and extrude them either out of Bolotnaja Square and the opposite side of the Obvodnyj channel, many anarchists as well as hundreds of other participants were left standing on the Small Moskvoretsky Bridge and later they started a new procession down the Bolchaja Ordynka street. The movement on the streets was stopped by the police. Media reported that a spontaneous demonstration at the beginning of the Bolchaja Tatarskaja Street and then blocked near the Tretyakov Gallery was organized by about 2 000 people. However, about 200-300 people came to police station 'Yakimanka" where the detainees were kept. Almost at midnight, the protesters were kicked out from there, most active of them were re-arrested. Police apprehended more than 3 hundred people, including at least 30 anarchists. According to preliminary data of the police, the total number of detainees rose at 450, while 11 participants and about 30 policemen wounded, including knife wounds. Law enforcement agencies reported, three policemen got a head injury, two - split chins and 7 policemen suffered from the gas sprays. At the police stations detainees were being bitten, an ambulance took from “Meshchansky” station three participants. The interrogations of injured have been already started in hospitals. The prosecutor's office launched criminal cases under article "Calls for the riot" and "Violence against representatives of authority", nevertheless, the violence inflicted by police was legal. All the detainees are to face Article 19.3 of the Administrative Code (disobeying a lawful order of a police officer), according to the laws, they can be arrested for 15 days. Most of the activists spent the night in police stations. It is also reported of the allegations against some protesters referring to Articles Part 3. 212 of the Criminal Code - “Calls for the riot”, and Part 1 of Art. 318 of the Criminal Code - "Violence against representatives of authority"
According to police, "March of Millions" gathered about 8000 people. Some opposition members claim that here were about 100 thousand people. But 20,000 participants seem to be most realistic. Let us remind that the large-scale protests started in Moscow in December after the falsification of parliamentary election results, and went on following the presidential election on March 4. The Russian opposition movement consists of several groups. On Sunday, May 6, demonstrators with (hanging) black and red flags cooperated with representatives of the Libertarian Party of Russia, and Russian Orthodox monarchists walked with people who have the portraits of Cuban revolutionary Che Guevara in their hands. But they all were united by an aversion to the perspective of Vladimir Putin’s return in the Kremlin for another 12 years. Anarchists In "March of Millions"
In Moscow, a solidarity action was organised for "the Belgrade six"